Careers in science, technology, engineering and math (STEM) are often at the forefront in developing solutions to some of today’s biggest challenges, but what does it really mean to have one of these jobs? With a maiden name that literally translates to “master builder” and then growing up in a home designed by her architect uncle, Cathleen Guthery seemed destined to become an architect. Her childhood home initially spurred her interest in becoming an architect and now she is one — plus a senior associate and project manager — at FSB with 17 years of experience under her belt. Cathleen starts her day early so she can tackle the most important tasks before the office gets busy and then she coordinates with her project teams. 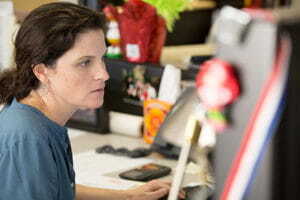 On any given day, her time is primarily focused on communicating. Whether it’s verbal or written, Cathleen has to ensure the effective exchange of a wide variety of information between the in-house teams, clients and contractors while also making sure everyone remains on the same page and understands what’s being communicated. 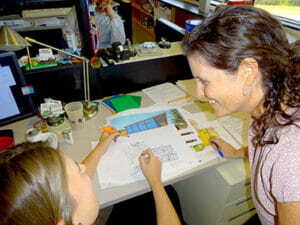 In addition to this monumental task and generally keeping her project teams on task and moving forward, Cathleen also drafts contracts, creates and reviews project schedules and budgets, preps presentations, writes design narratives and meeting minutes, reviews drawings and specs, reviews contractor pricing, creates punch lists and visits job sites. Even though it can be stressful, Cathleen thrives on it — the variety of the job, the opportunity to build lasting relationships with clients and colleagues alike, and the design challenge of creating buildings that will have a long-term, positive impact. Cathleen also thrives on sharing her passion for STEM. Whether it’s local high school students, college interns or fellow FSBers, Cathleen encourages them to stick with it. Why? Because there are tremendous opportunities for careers in STEM fields — some don’t even exist yet. However, with students in particular, she tries to dispel the myth that you have to be a math whiz to work in a STEM-related field, telling them not to let misplaced fear keep them from pursing their career goals. The most rewarding part of working in STEM for Cathleen is knowing the genuine impact she has on clients and those who will use the buildings she’s helped develop. At the end of the day, she says, it’s fulfilling to know that you’ve delivered a project that helps clients achieve their goals and serve their purpose. “That can make a huge difference,” Cathleen says. “At FSB, we’ve had interns who come here planning to be an engineer and leave wanting to be architects, and vice versa. It’s good to see different environments and what it’s really like.” Bottom line? Don’t limit yourself. Make sure you explore all the options.